Summertown Interiors, the UAE’s leading fit out contractor specialising in green interiors, has released its 2016/2017 Sustainability Report – a key milestone for the company as it continues its journey to embed sustainability into every aspect of it business. Prepared in accordance with the Global Reporting Initiative (GRI) Summertown’s second Sustainability Report highlights the company’s sustainability milestones, reports on the impact of key material issues and provides a benchmark by which to measure future efforts. The report outlines eight material issues identified through the analysis of environmental, social and ethical issues associated to the company and by reviewing stakeholders’ feedback. Reducing its environmental impact both in its own office environment and on project sites is paramount for the company’s sustainability goal to be carbon neutral by 2020. In 2009, Summertown was the first fit out contractor to occupy LEED Gold certified interiors in the UAE. Later in 2016, the company was awarded the LEED Gold certification for its existing building; operations and maintenance (LEED EBOM). Summertown continues to use the U.S. Green Building Council’s LEED framework to measure and improve on their environmental performance, resulting in a 57% reduction of its water consumption; a 10% reduction of its energy consumption and a 39% reduction of waste sent to landfill from the office over the last 3 years. The company also uses the Dubai Chamber of Commerce’s CSR Label as a diagnostic framework to measure its sustainability progress. Over the past five years it has improved its CSR Label score from 65% to 84%, demonstrating continual improvement across the four key areas – Environmental, Workplace, Marketplace and Community. In addition to improving its own environmental performance, Summertown supports its clients on their sustainability journeys. The report informs that 64% of its projects met the regional sustainability criteria or were awarded LEED certification – this includes the fit out of the Smart Dubai Office which aims to achieve LEED Gold certification. Investing in the company’s health and wellbeing strategy is a key focus, and Summertown recognises that a healthy and happy workforce delivers wider business benefits. The report details the outcome of an employee survey that was conducted to assess the impact of its existing health and wellbeing activities. Summertown recognises that to be sustainable it must continually listen to and understand what matters most to its staff, customers, suppliers and the communities affected by its operations. Engaging with these stakeholders and responding to their concerns and views is a key priority for the company. 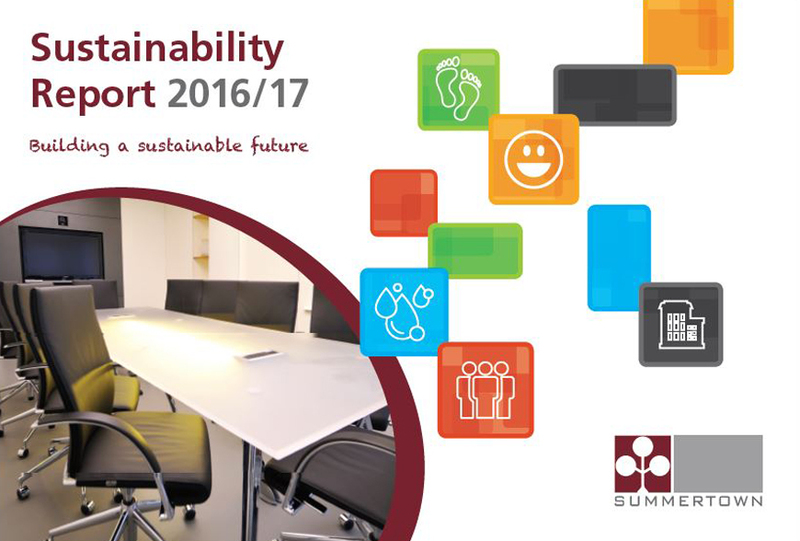 The new 2016-17 Sustainability Report can be downloaded from Summertown’s new website www.summertown.ae launched this week for an improved user experience and enhanced visualisation of the company’s interior projects.